After yesterday's inspiration fiasco, I looked to my readers on Tumblr for inspiration. I asked for ideas and some readers happily obliged. smoresz suggested: I’d love to see a smoky gray nail fading from dark to light, with a red/orange/yellow sparkle on top of it so it looks life fire and smoke! Ask and you shall receive...kinda. Unfortunately this wasn't the best glitter choice for the manicure so I'm not entirely happy with the result. The gradient was done with Essence Movie Star and Zoya Carey. 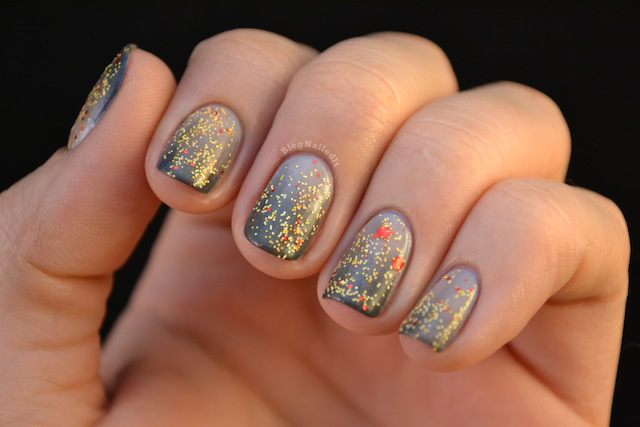 The glitter topcoat is Phoenix from Pretty and Polished. I wish I had an awesome metallic glitter that would've been appropriate because this beautiful matte just isn't right for the effect. Beautiful, just not right. I hope I did your idea justice smoresz! Enjoy! What a gorgeous mix of colors! I think it turned it really great! Phoenix looks so awesome with this! Great inspiration and great mani! I think it works out really well. I loved the combo. about the glitter though, maybe electrify from china glaze? since is metallica with gold and red-orange glitters? It really looks like the little crackling of sparks that are at the top of a fire. Like, I can almost imagine big campfire flames right underneath! This is super gorgeous! and very creative! I looove it! I like this, I think you picked the perfect polishes! !